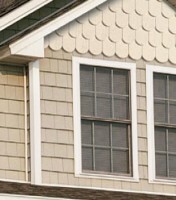 Homecraft®, Inc. is proud to install quality Mastic Vinyl Cedar Shake Siding on Delaware homes. This siding option is perfect for homeowners that are looking for a rustic exterior look while maintaining durability and aesthetics. Plus the vinyl material requires no painting and virtually no maintenance. Rich, realistic texture and deep random grooves replicate the beautifully rustic look of real cedar shakes, without the upkeep and maintenance. If you are seeking a more traditional look for your home’s exterior, contact Homecraft®! We are the only Brandywine Valley vinyl siding contractor that can remarkably install the realistic Cedar Shake Siding from Mastic. Call Homecraft®, Inc. at 1-877-494-0377 today to schedule a free in-home estimate for siding. Or simply fill out our convenient on-line “Request a Quote” form.